Cake Cutting- "How Sweet It Is" by James Taylor or Michael Buble or "Sweet Caroline"
Originally, Chris and I wanted to have multiple cakes...3 to be exact. Christopher and I are a fan of cheesecake so we want to have that be one of our cake choices. We also love, love, love, chocolate cake, so we wanted that to be another cake. Instead of going with that, we found a baker that would give us one beautifully simple cake and two sheet cakes with all of our flavors. 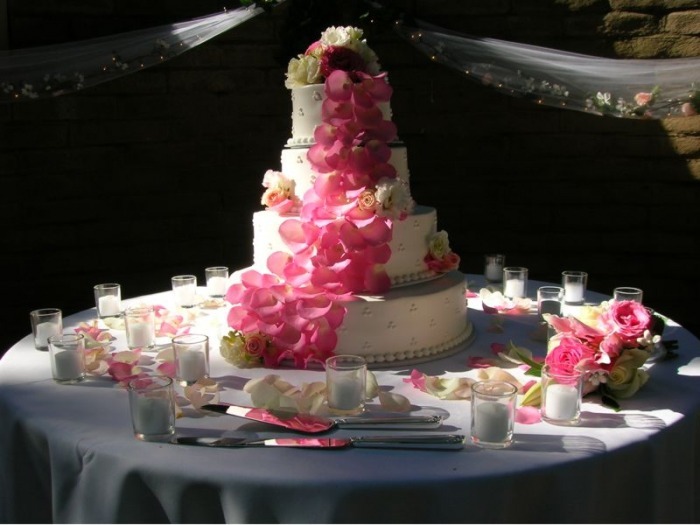 We ended up choosing a three tier tri-dot decor (with fondant) with a Strawberry White Chocolate Mousse for the first two layers, a Kahlua cake for the bottom layer and one sheet cake, and a white cake with lemon buttercream for another sheet cake. Before I did not care about the cake; now I can't wait to cut the cake and eat!